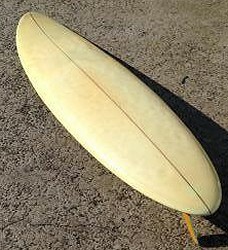 1971 Klemm Bell Double Ender, shaped by Wayne Lynch in May 1971, 6ft 10"
Foam blank with redwood stringer, Volan glassed?. FIN: 10" (est.) Greenough Stage III, orange-green laminated. Klemm-Bell, Wayne Lynch designed and shaped: black at forward sweet spot, above. Deck: 3031 - pencil on blank. Said to have single handily revolutionised backhand surfing, Wayne Lynch won the European Title in 1968, the Australian Junior Men’s Title 1967, 1968, 1969 and 1970, and the Bells Beach Junior Title 1966, 1967, 1968 and 1969. After an outstanding competitive record as a junior, began shaping circa 1967, see below. He starred in Paul Witzig’s films Evolution (1968) and Sea of Joy (1971). In Evolution Wayne Lynch rides at least seven different boards during the film, shot in about12 months; illustrating the rapid design changes in this period. Intitially started (pre-1967) by Terry Klemm and Reg Bell at Williamstown, Victoria; Phone: 314 4129. When these premises burnt down (circa 1968) the company relocated to 221 Nepean Highway, Gardenvale; Phone 96-5148. Around 1971 they opened a retail outlet on the Nepean Highway, Chelsea, and a factory at Geelong Road, Torquay. 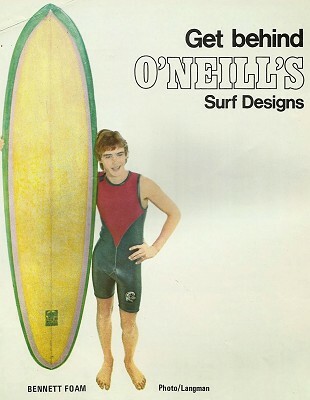 Although a Torquay local, Wayne Lynch had previously had a long shaping-design relationship with South Australia's John Arnold Surfboards along with sponsorship by O'Neill Wetsuits, originally started in Santa Barbara , California in the early 1960s. A Klemm-Bell Sufboards advertisement for mid-late 1971 offers Wayne Lynch Hand Shapes and Designs at Klemm-Bell's. Later Klemm-Bell shapers included Kym Thompson, Jim Pollock, and Don Allcroft. John Arnold Surfboards started in South Australia in the late 1950s and, principally through licensing O’Neill Wetsuits (USA), was a major company in the 1960s surf industry. An advertisement for John Arnold Surfboards, late 1969 lists the shapers as Wayne Lynch, Wayne Dale and Sig Kwiatkowski; the latter two responsible for most of the production boards. An J.A. advertisement late 1970 notes the 'designers' as Wayne Lynch and Wayne Dale and they are available internationally, in All states of Australia - East and West coast USA - England - France. The export models were often fitted with fin boxes to facilitate freighting, first with WaveSet (one USA circa 1969 example noted, August 2008) and later Simplex fins and boxes. In the late 1970s, Wayne Lynch was sponsored by Rip Curl Wetsuits and shaped surfboards and sailboards for Rip Curl Surfboards at Torquay. An excellent example of this design in near original condition by one of Australia’s most famous surfers. Many thanks to Ken Lewis. 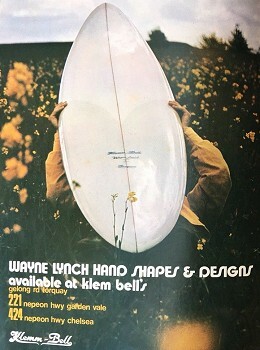 Advertisement: Wayne Lynch Hand Shapes and Designs at Klemm-Bell's. Surfing World Volume 15 Number 5, December 1971. 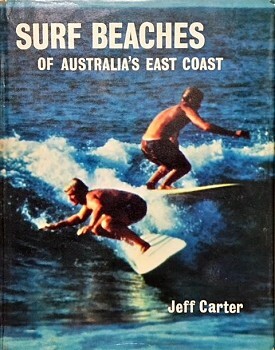 Carter: Surf Beaches (1968), Cover photograph of Wayne Lynch and Keith Paull (going right). Paull was the 1968 Australian champion, Lynch the Junior champion. Young: Nat’s Nat (1998) page 177, and following. Walding: Surf-o-rama (2008) pages 42 to 45. 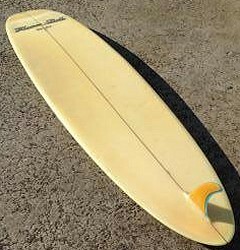 Early Wayne Lynch shaped board, circa 1967. Jimi Hendrix influenced art work by Simon Buttershaw. Features : Full Vee bottom, deepest at tail. Chamfered diamond tail. Note : Small square tail is obsured by grass. Fin appears to be in a box (unusual for the period), or reset, or non-original. Shaped by Wayne Lynch in May 1971.
from Pollard, Jack (ed. ): Ampol’s Sporting Records, page 607. Geoff Cater (2018) : Wayne Lynch Double-ender, 6ft 10'' 1971.